If the NFL playoffs started right now, the Eagles would unfortunately be on the outside looking in, as the seventh seed in an NFC field that includes six teams. Thankfully the playoffs will not become official for 14 days. The easiest way for the Eagles to get to January is to win their final two games and have the Cowboys lose one, realistically at home to the 10-4 Indianapolis Colts next week. A few other scenarios exist, but they are a bit less likely as Detroit, Seattle, or Green Bay would have to lose both of their final two games while the Eagles win both of theirs. Green Bay faces the lowly Buccaneers next weekend, so let’s rule them out. Seattle has two tough games at Arizona and home against the Rams, who play all opponents tough and beat the Seahawks earlier in the season, but it is difficult to envision them dropping two straight considering their strong play recently. That leaves Detroit, the current leader of the NFC North by way of a tiebreaker over the Packers. The Lions will likely be heavy underdogs in the Week 17 bout at Lambeau, but in order for that game to matter to the Eagles, they would need to lose on the road to the struggling Bears next weekend. Is that possible? You decide. I don’t trust Jay Cutler as far as I can throw him, but the Lions certainly didn’t look like world-beaters in a narrow win over Minnesota today. Still, the Eagles easiest road remains a backdoor NFC East title with the Cowboys following a December tradition and dropping a pivotal game late. For all of the issues that went wrong tonight, the Eagles should be far superior to their remaining opponents in the Redskins and Giants. If help comes, it ideally comes next week by way of the Colts, but stranger things have happened (Think Week 17 in 2008 with the Raiders and Texans opening up a door for them). Tonight hurt, but it was not a death sentence, and with the birds playing a day early on Saturday, a win will put the pressure squarely on the Cowboys who have struggled at home. Hope NIck Foles gets cleared, beat a bad Washington team, and bite your nails on Sunday. The Eagles need help, but it ain’t time to look at mock drafts quite yet. This entry was posted in Uncategorized and tagged Andrew Luck, Arizona Cardinals, Chip Kelly, Dallas Cowboys, Detroit Lions, Drew Balis, Green Bay Packers, Houston Texans, Indianapolis Colts, Jay Cutler, New York Giants, NFC, NFC Playoffs, NFL, Oakland Raiders, Philadelphia Eagles, Seattle Seahawks, Super Bowl, Tampa Bay Buccaneers, Tony Romo, Washington Redskins, Week 17 on December 15, 2014 by drewbalis. The Eagles are in Indianapolis for a Monday Night showdown against the Colts tonight. The last time they traveled to Indianapolis, not counting a preseason game in 2009, was for a Sunday Night showdown in November 2006. There is a certain novelty to playing AFC teams since you have to wait four years to play the same team again and typically eight years before returning to the same city. When appropriate, I would like to provide a recent history lesson on gameday about the Eagles particular opponent, and we have one here that I feel both connects past, present, and future. The date was November 26, 2006, and the eventual Super Bowl champion Colts were rolling at 9-1. The same could not be said about the Eagles. Andy Reid’s squad entered the contest with a 5-5 record, but it felt a lot worse. They had dropped four of their past five games and a week earlier lost starting quarterback Donovan McNabb to a torn ACL in an ugly home loss to the Titans. A McNabb sports hernia injury helped derail the 2005 season, and the general consensus was that if he was lost for any significant amount of time, the season was over. Jeff Garcia was the Eagles next man up. Garcia at one time was a very successful signal-caller for the 49ers, but over the past few years leading up to 2006, he had lost starting jobs in San Francisco, Cleveland, and Detroit. Garcia had played okay when called upon to relieve McNabb the previous week, but many folks did not trust him to move the ball and were calling for then fan-favorite A.J. Feeley. The scrappy veteran did have one thing going for him though. He was familiar with Reid’s west-coast system, and back then, Reid was decently good at tailoring schemes to some of his players . The night, as expected, was ugly. A full box score and recap is available here. Joseph Addai gashed the Eagles for three first half touchdowns, and the visitors were down 21-0 in the second quarter before you could blink an eye. For a normally stout Jim Johnson defense, it was an embarrassing performance as the Colts posted 420 total yards in a 45-21 victory. Peyton Manning was only responsible for 183 of those yards and honestly had a pretty pedestrian night. Garcia — based on raw numbers — actually outperformed him. This brings us to the major point of the post. Garcia got the Eagles on the board with a touchdown pass to L.J. Smith in the second quarter and found Reggie Brown in the third quarter for another. He took care of the football and only threw four incomplete passes the entire game. After the final whistle, the big story was how poorly the Eagles defense played and how Reid was headed for a second consecutive losing season, but another plot was now scratching the surface. The Eagles might not have been good enough to beat a powerhouse Colts team, but if a few issues could be cleaned up, they had a quarterback capable of beating some NFC teams to keep their dwindling playoff hopes alive. Garcia did just that. The next week he led the Eagles to an epic Monday Night victory over the Panthers (more on that in a couple months) and proceeded to win three consecutive NFC East road games to capture the division crown. From the aforementioned Colts game through the end of the season, Garcia went 122-for-200, 1513 yards, 11 touchdowns, and only two interceptions. The run under Garcia ended at the Superdome with a 27-24 loss to the Saints in the second round of the playoffs after again beating the Giants one week earlier. Garcia would sign with Buccaneers in the offseason and lead them to the playoffs the following season. 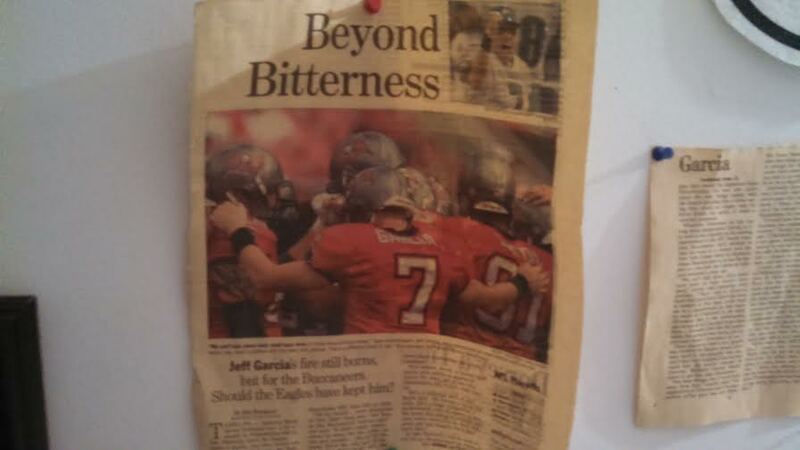 A January 6, 2008 Philadelphia Inquirer article about his time in Tampa Bay still hangs in my room to this day. You could say I really liked Jeff Garcia. Who didn’t like Jeff Garcia though? Philadelphia was in the midst of a miserable sports winter. The Phillies had just missed out on what would have been their first playoff berth since 1993. The Flyers were in the midst of one of their worst seasons in franchise history, and the Sixers were having a falling-out with long-time franchise icon Allen Iverson. The city needed hope, and a fiery red-head came to the rescue just in time. This is a dangerous hypothetical path to go down, but the Eagles missed the playoffs the following year in 2007, going 8-8. Had Garcia not turned 2006 around, it would have been three straight years of no playoffs. Would Andy Reid have survived that? If he hadn’t, what are the odds that Chip Kelly would be here today? Would Nick Foles be playing somewhere else? Those questions bring me to tonight. Eight years later, we are back in Indianapolis, and instead of Manning-Garcia, it is Andrew Luck vs. Nick Foles. The average age of the quarterbacks that night were 33. Tonight, that number is 25. Both teams are expected to be contenders this season, and I even picked the Colts to win the Super Bowl. Much like Manning-Garcia, Luck is the perceived star. Akin to Manning, he was the number one overall pick in the draft while Luck and 86 other players heard their names called before Foles in the same draft class. Foles’ numbers are for the most part better than Luck’s through the early portions of their careers, but most football people will tell you that Luck is the far superior player. Tonight, we get to see them go at it head-to-head. I called for a narrow Colts victory before the season. I badly want to be wrong, but a shootout loss where Foles matches Luck, similar to what he did against Drew Brees in the playoffs last year, would not be the worst thing in the world. Nearly eight years ago, the Eagles lost a game in Indianapolis but temporarily found a quarterback. Tonight, they have an opportunity to show the football world that they have a quarterback for years to come. This entry was posted in Uncategorized and tagged A.J. Feeley, Allen Iverson, Andy Reid, Chip Kelly, Cleveland Browns, Detroit Lions, Donovan McNabb, Drew Balis, Drew Brees, Indianapolis Colts, Jeff Garcia, Joseph Addai, L.J. Smith, Monday Night Football, Peyton Manning, Philadelphia Eagles, Philadelphia Inquirer, Reggie Brown, Sunday Night Football, Tampa Bay Buccaneers, Tennessee Titans on September 15, 2014 by drewbalis. Thanks to the Lions thrashing the Giants on Monday Night Football last night, the Eagles sit atop the NFC East standings after Week 1. Ugly losses from the Redskins and Cowboys preceded the Giants beatdown. This is a bit rare in part because teams sometimes face a squad within their division in the season opener, but as mentioned last night, there is some precedent here with the year 2006 coming to mind. In Week 2, the Eagles will already know what the rest of the division has done heading into their Monday Night showdown against the Colts. The Giants have a tough home matchup against the Cardinals. The Cowboys are on the road against the 1-0 Titans, and the Redskins host the Jaguars, who gave the Eagles all they could handle for three quarters. The only other team alone at the top of its division is the Broncos. I agree, Chip. First place does taste good. This entry was posted in Uncategorized and tagged Arizona Cardinals, Chip Kelly, Dallas Cowboys, Denver Broncos, Detroit Lions, Drew Balis, Indianapolis Colts, Jacksonville Jaguars, New York Giants, Philadelphia Eagles, Tennessee Titans, Washington Redskins on September 9, 2014 by drewbalis. Just the way we drew it up, eh? The Eagles were not great yesterday afternoon, but they might as well have been the 1972 Dolphins when you stack them up against the rest of the division. The Redskins could only muster six points against a Texans team that had not won since September 15, 2013. Tony Romo was back in style, tossing three interceptions in a 28-17 home loss to the 49ers that saw much of Jerry World booing. I believe the Giants are slightly better than people think and don’t exactly trust the Lions, but Detroit has won its last three season openers while the Giants have dropped their last three. The two teams go at it in Game 1 of the Monday Night doubleheader, which means the Eagles could be alone in first place before midnight. There is some precedent with this as it relates to the Eagles. Back in 2006, they were 1-0 following Week 1 while the other three teams in the division were all 0-1. The birds went on to go 10-6 that year and take the division. The Eagles were far from perfect in their victory over the Jaguars, but akin to what we anticipated, they might be the best team in a weak division by default. This entry was posted in Uncategorized and tagged 1972 Dolphins, Dallas Cowboys, Detroit Lions, Houston Texans, Jacksonville Jaguars, Monday Night Football, New York Giants, Philadelphia Eagles, San Francisco 49ers, Washington Redskins on September 8, 2014 by drewbalis.